Contracts for difference (CFDs) enable investors to trade numerous markets with an award-winning, easy-to-use platform at Capital.com. CFDs are derivative products that allow investors to trade on margin, facilitating greater exposure to financial markets. You can trade CFDs on multiple asset classes such as shares, indices, commodities, currencies and cryptocurrencies. Capital.com’s platform provides access to 2,000 different financial instruments across these asset classes, so you are only ever a few clicks away from trading the world’s most popular markets all in one place. A share represents a portion of ownership in a company. The value of shares rise and fall respective to the company’s value, which provides a basis for speculation on these movements in a stock market. However, an investor need not buy a share to gain the benefits of share trading; they can make profit through CFD trading markets. A traditional way of investing in the stock markets involves the purchasing of shares in a company on a stock exchange, hence owning the underlying asset itself. This is considered a long-term approach, as the investor is waiting for a sustained price increase. Another way of gaining exposure in the stock markets is to trade CFDs on shares, speculating the price changes of an underlying stock, without having to own it. The tends to be considered a shorter-term approach. Shares prices are determined by a combination of factors such as the supply and demand for the the share in question, which is affected by current company earnings as well as future performance predictions. 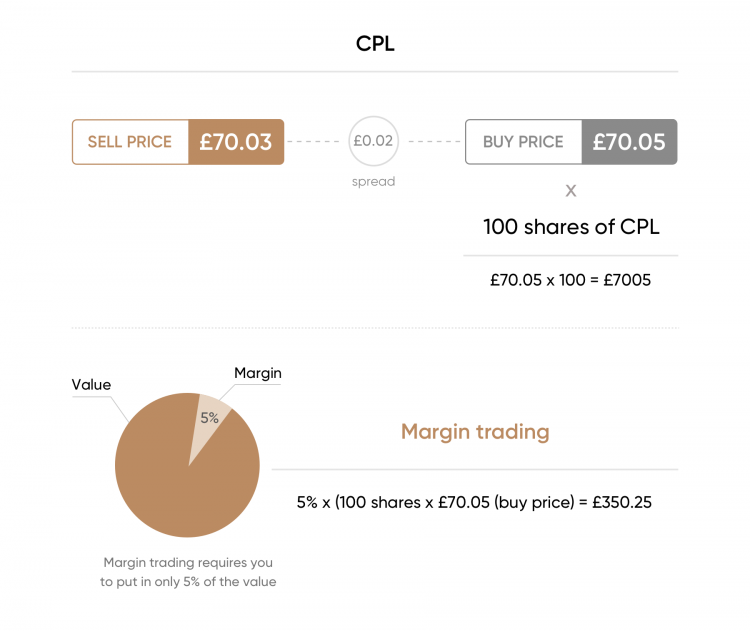 CFDs require a lower initial outlay than traditional share trading because CFDs are traded on margin. Consequently, CFD traders are able to speculate on stock price movements of the most valuable and popular share mar around the globe. Capital.com offers 1700 different shares trading on the world’s major stock exchanges. A stock index is a measure of a particular section of the stock market, whether that be a list of the biggest companies in that market or a particular sector in the markets. The value of the index is the sum of its components and tracks accumulated changes in the individual companies. For example, the Dow Jones Industrial Average, or, in short, the DJIA, one of the most watched indices, and includes 30 companies traded on the New York Stock Exchange (NYSE) and the NASDAQ. The DJIA is not tied to a particular industry, but is comprised of the major companies and sectors of the U.S. economy. Apple Inc, The Boeing Company, IBM Corporation, Johnson & Johnson, Nike, Inc., Visa Inc., Exxon Mobil Corporation and more are among the 30 components chosen to represent the economy of the entire country. You can gain exposure to indices markets by trading CFDs. CFDs on indices mirror the composition of a certain index. If an investor wants to speculate on an industries performance, or the performance of a whole economy, they can trade CFDs on indices. Our trading platform enables investors to benefit from price movements in major global indices. A CFD contract is valued in the native currency of the indice that it is on. For instance, a CFD on the FTSE 100 is valued in pounds Sterling. Commodities trading is where raw material assets such as sugar or wheat are bought and sold. In other words, commodities are the raw materials that comprise the global economy. Commodities can be categorised into two types: hard and soft. Soft commodities are commodities that tend to be grown, these include: coffee, sugar, fruit, livestock and many others. Whereas hard commodities are commodities that must be extracted in some variety, including those such as: gold, silver and oil. You can trade CFDs on commodities. With CFDs, you do not own the underlying asset physically. For instance, there’s no need to store any crude oil when you trade Brent Crude CFDs. You simply trade the price of the commodity and you’ll never have to take delivery. Trading CFDs on currency pairs is a common way to profit from the FX market. In a contract, the buyer and seller agree to exchange the difference in value between the contract is opened and closed. When CFD trading, you speculate on currency pairings by trading a specified amount of contracts in the base currency. The FX market is suited to CFDs and leveraged trading due to the relatively small price movements that occur in these markets. CFDs provide a simpler and more cost effective way to trade commodities compared to futures. There are many ways to gain exposure in the cryptocurrency markets. A trader can purchase the cryptocurrency itself on numerous exchanges. For example, purchasing Bitcoin on Bitfinex. In this instance, the trader owns the cryptocurrency themselves. This tends to be considered a longer-term investment, as traders are waiting for a substantial price increase in order to profit from their holdings. Otherwise, the alternative is to trade CFDs on cryptocurrencies, speculating on the price movements, without holding the underlying asset. This tends to be considered a shorter-term investment. There are crucial differences between trading CFDs on cryptocurrencies and exchanging cryptocurrencies themselves. When you purchase cryptocurrency, it is stored in a wallet, whereas when you trade CFDs on cryptocurrencies, the position is held in your account, which is regulated by a financial authority. You have more flexibility when you trade using CFDs because you are not tied to the asset; you have merely bought or sold the underlying contract. Additionally, CFDs are a more established and regulated financial product. It is worth noting, however, that the increased volatility of bitcoin, matched with leveraged trading, can provide amplified wins as well as losses. Ensure you employ rigorous risk management techniques and utilises stops and limit orders.